Han-Tek inteGREAT software acts similar to an air-traffic controller by connecting your automation, plant and warehouse operations with insightful and actionable data into one all-inclusive ecosystem. inteGREAT software brings together the islands of automation with a robust and reliable solution that can extend to manual or fully automated processes. inteGREAT modular design and front end SCADA system with unlimited tags provides a software package that is user-friendly that can be useful from the c-suite to managers to field operators. Are you an OEM looking for Panel Manufacturer? Han-Tek offers the ideal solution for OEMs looking for a panel manufacturing resource with extensive knowledge of North American standards and the ability to design and manufacture control panels matched to their specific needs – using only the highest quality electrical and electronic components in every control panel we build. Contact Han-Tek to begin discussions about designing control systems to help you improve efficiency, performance, and productivity. We’ll discuss your integrated control systems and potential solutions for your consideration. Han-Tek can design advanced, integrated control systems capable of supporting simple, single-cell automation to the most complex, plant-wide production and supply-chain control systems. In the same way we go about designing automation and materials handling systems – Han-Tek’s “Problem. Solved.” process – our engineers will undergo a thorough discovery to understand your market, your specific manufacturing processes, as well as your automation or materials handling systems you have in place to support the process. Then we’ll design, configure and install a control solution that will optimize the performance and productivity of your current process. And the system we design will be very easy to service as needed and providing you the ability to expand with your production processes – while meeting or exceeding UL 508a, NEC, and OSHA. We work within the framework of your control specifications including Allen Bradley, Siemens, Omron, Beckhoff, and many more. To effectively display and control your automation and materials handling systems, Han-Tek routinely integrates Human Machine Interface (HMI) touchscreens at one or more locations near the automated system. By doing so, we give your people a user-friendly graphic visualization of the process, helping to take operations management, materials handling controls, and process optimization to a whole new level. Our experienced software engineers can use HMI to connect to every device on your automated system. 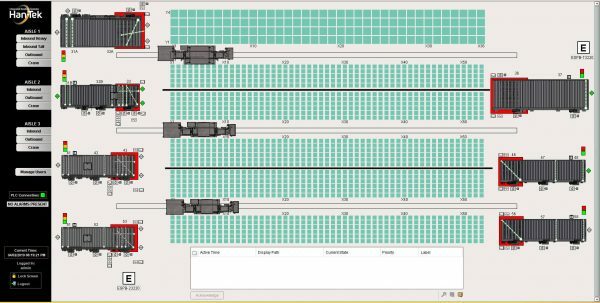 With this ability, operators no longer have to open a large control cabinet, connect a laptop to the PLC, and decipher complex PLC ladder logic. Rather, system diagnosis and optimization is accomplished through access to a simple touchscreen – in the same intuitive way they would use a smartphone or tablet. So you can be sure that any Han-Tek control system will make the most of the today’s most advanced PLC and SCADA technologies. 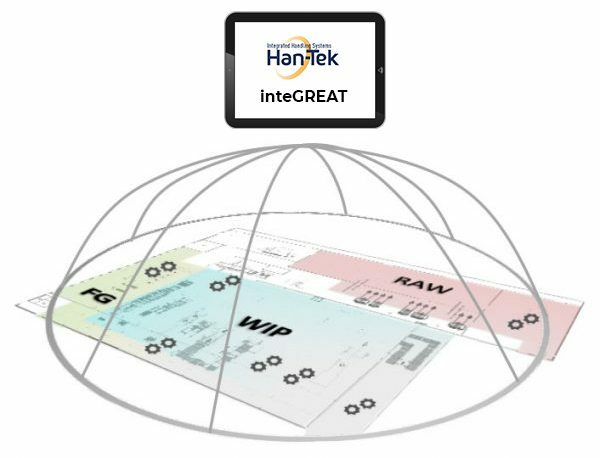 What’s best, Han-Tek can integrates critical diagnostics into our InteGREAT Control Solutions that alert the operator as soon as there’s a problem in the system. It helps the operator pinpoint the location of the issue, providing the opportunity to get your line back up and running, quickly and efficiently.